HomedigestAre you ready for pop-up, shape-shifting food? Just add water. Are you ready for pop-up, shape-shifting food? Just add water. Gelatin sheets that transform into edible 3D shapes when dunked in water could save food shipping costs. And they're fun. Researchers at MIT’s Tangible Media Group are exploring ways to make your dining experience interactive and fun, with food that can transform its shape by just adding water. 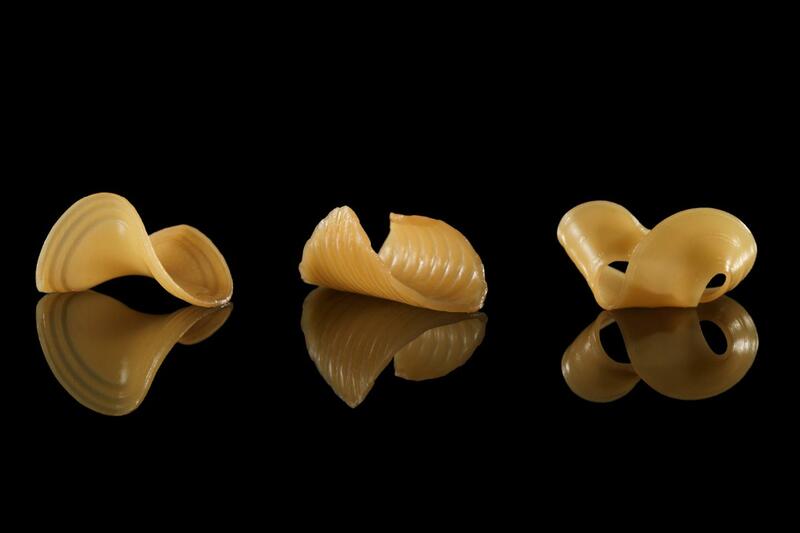 Think of it as edible origami or culinary performance art — flat sheets of gelatin and starch that instantly sprout into three-dimensional structures, such as macaroni and rotini, or the shape of a flower. But the researchers suggest it’s also a practical way to reduce food-shipping costs. Edible films could be stacked together, IKEA-style, and shipped to consumers, then morph into their final shape later when immersed in water. At MIT, Wang and associates had been investigating the response of various materials to moisture. They started playing around with gelatin (as in Jello), a substance that naturally expands when it absorbs water. Gelatin can expand to varying degrees depending on its density — a characteristic that the team exploited in creating their shape-transforming structures. To see how their designs might be implemented in a professional kitchen, the researchers showed their engineered edibles to Matthew Delisle, the head chef of high-end Boston restaurant L’Espalier. They jointly designed two culinary creations: transparent discs of gelatin flavored with plankton and squid ink, that instantly wrap around small beads of caviar; and long fettuccini-like strips, made from two gelatins that melt at different temperatures, causing the noodles to spontaneously divide when hot broth melts away certain sections. “They had great texture and tasted pretty good,” Yao says. The researchers used a laboratory 3-D printer to pattern cellulose onto films of gelatin. But they suggest users can reproduce similar effects with more common techniques such as “screen printing” in an open-access paper presented at the Association for Computing Machinery’s 2017 Computer-Human Interaction Conference on Human Factors in Computing Systems (CHI 2017). They envision that their “online software can provide design instructions, and a startup company can ship the materials to your home,” Yao says. This research was funded, in part, by the MIT Media Lab and Food + Future, a startup accelerator sponsored by Target Corporation, IDEO, and Intel. We developed a concept of transformative appetite, where edible 2D films made of common food materials (protein, cellulose or starch) can transform into 3D food during cooking. This transformation process is triggered by water adsorption, and it is strongly compatible with the ‘flat packaging’ concept for substantially reducing shipping costs and storage space. To develop these transformable foods, we performed material-based design, established a hybrid fabrication strategy, and conducted performance simulation. Users can customize food shape transformations through a pre-defined simulation platform, and then fabricate these designed patterns using additive manufacturing. Three application techniques are provided – 2D-to-3D folding, hydration-induced wrapping, and temperature-induced self-fragmentation, to present the shape, texture, and interaction with food materials. Based on this concept, several dishes were created in the kitchen, to demonstrate the futuristic dining experience through materials-based interaction design.